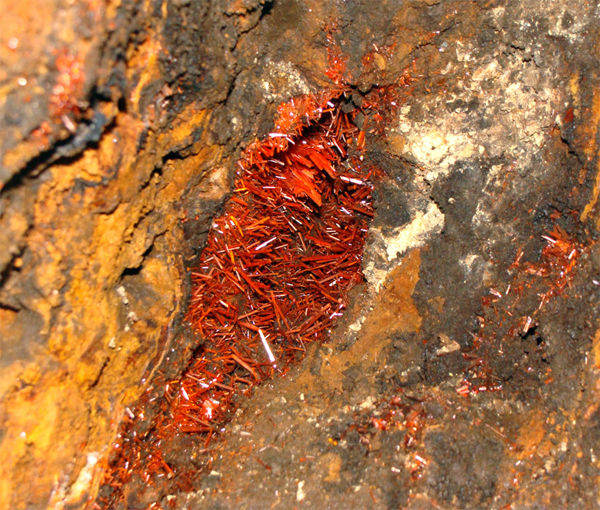 The Adelaide Mine is undoubtedly the world’s most famous producer of crocoite specimens. In the history of mine only a few great pockets with top quality specimens have been found – in 1970`s, 1990`s and then in 2010! Here you can read the first ever report about this recent great find. 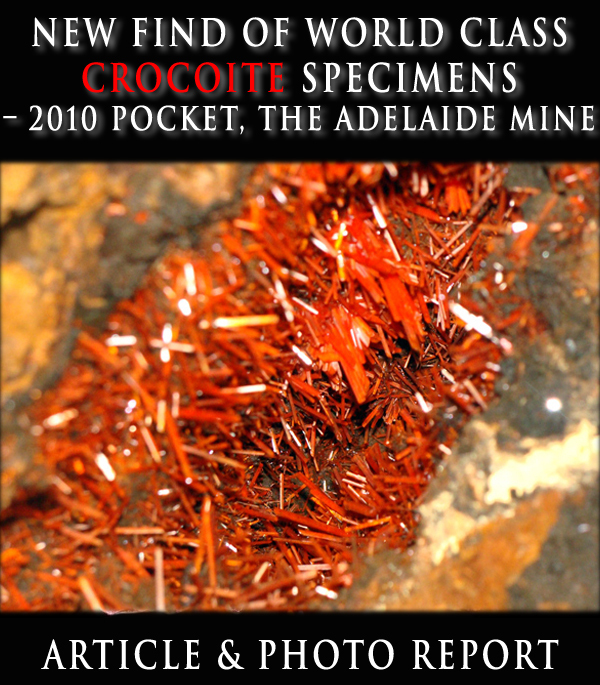 Spirifer Minerals received advance notification of this exciting new find and as a result has 2010 Pocket crocoite specimens available before anyone else. 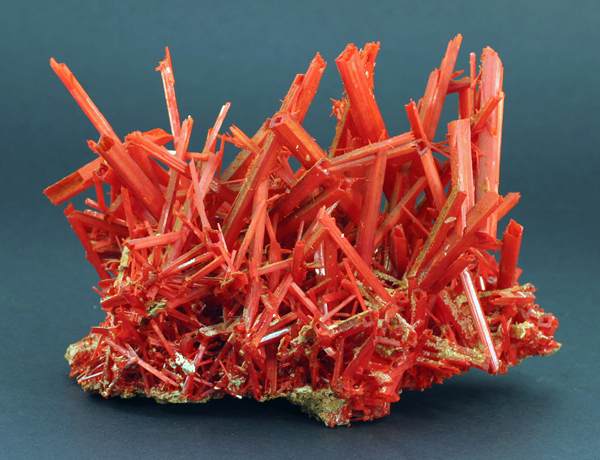 Crocoite is a rare mineral that was first discovered in Russia and has since only been found in a small number of other locations around the world. 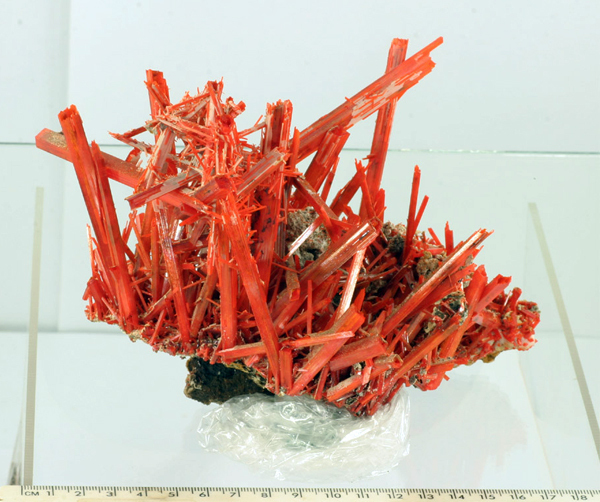 It’s most notable occurrence is in the Dundas region on Tasmania’s West Coast, which has produced the world’s largest, best quality and greatest abundance of crocoite crystals. 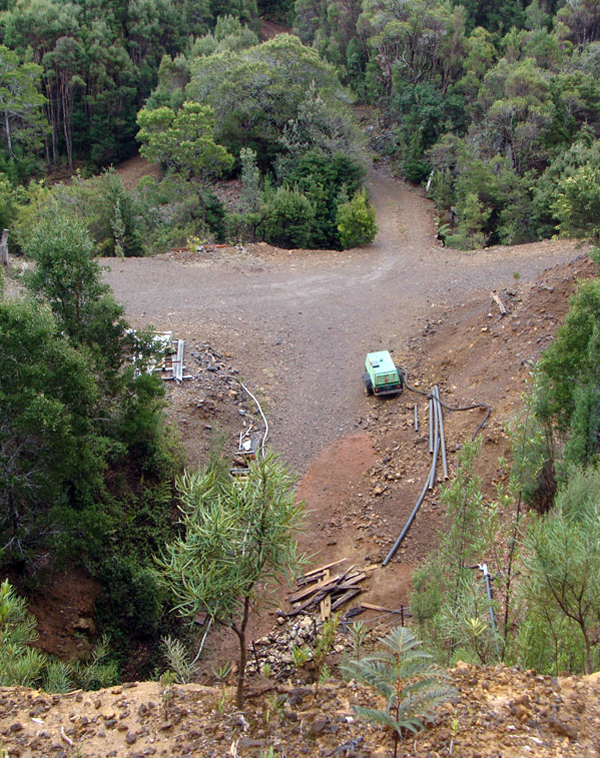 There are several mines in this area and of these the Adelaide Mine is one of the most famous. 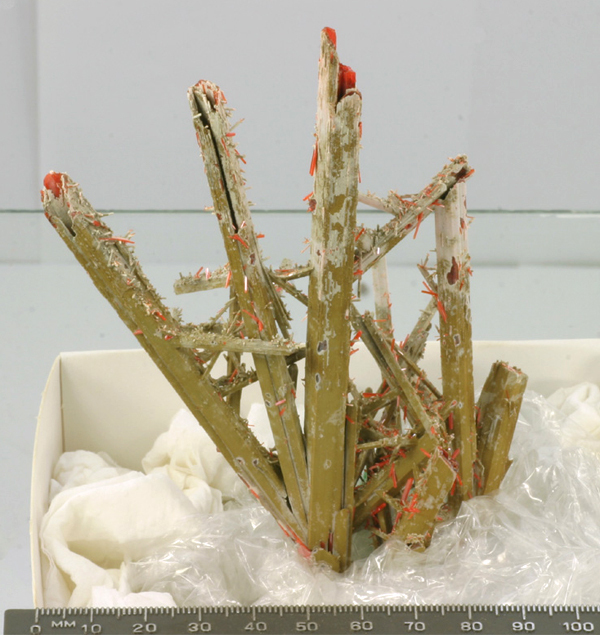 Crocoite specimens from the Adelaide Mine are renowned, with pieces displayed in museums and educational institutions worldwide. In recognition of the significant crocoite deposits within the state it was officially proclaimed the Mineral Emblem of Tasmania in 2000. 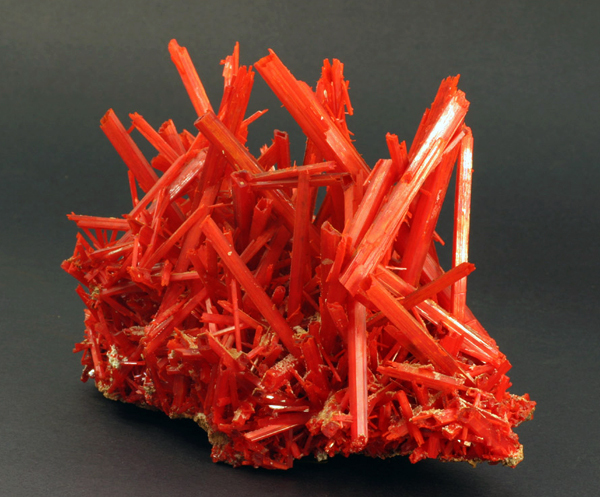 Crocoite is formed through the alteration of serpentine, stichtite and galena, releasing lead and chromium into solution. 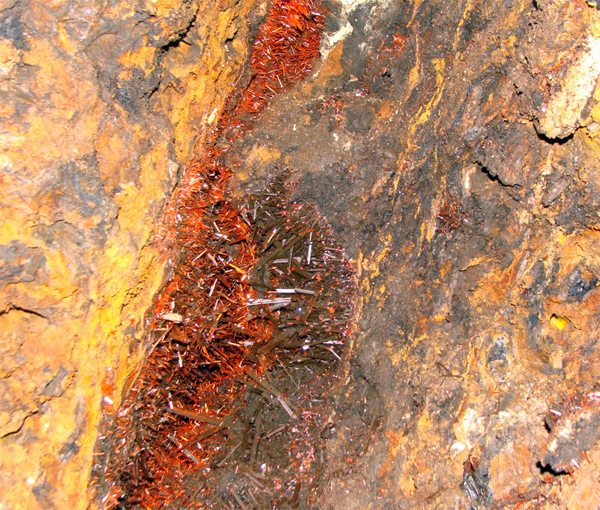 The resulting metal rich fluids crystallised as crocoite in the unique geologic environment of the Dundas area. 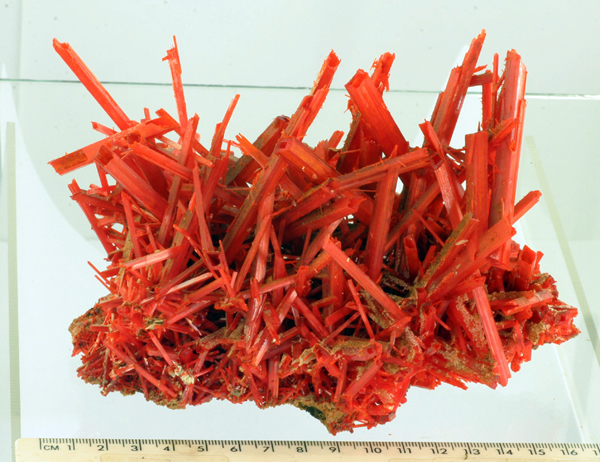 Crocoite has minor value as an ore of lead or chromium, however it is highly valued in it’s natural state as mineral specimens due to it’s bright orange-red colour and intricate crystal formation. 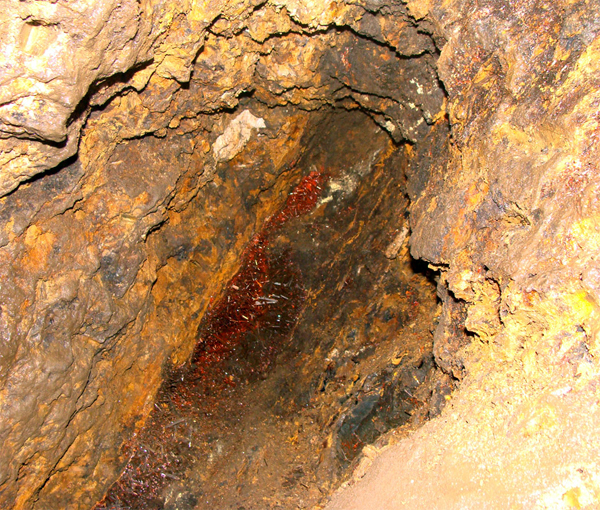 The Adelaide mine operation is within the oxidized zone of the deposit, which may be 75 m deep. Gossans formed during oxidation are very porous with numerous open spaces, which are great places for the growth of secondary minerals. 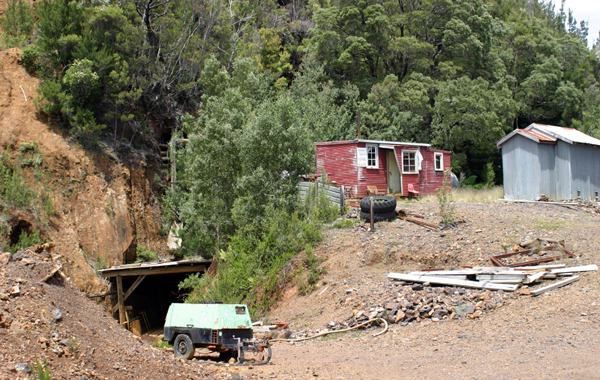 The Adelaide mine was worked on a large scale for lead and silver from 1890-1915. 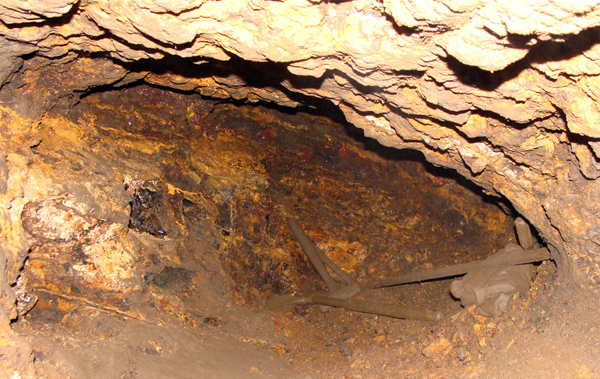 It was reopened in 1970 as a specimen mine. 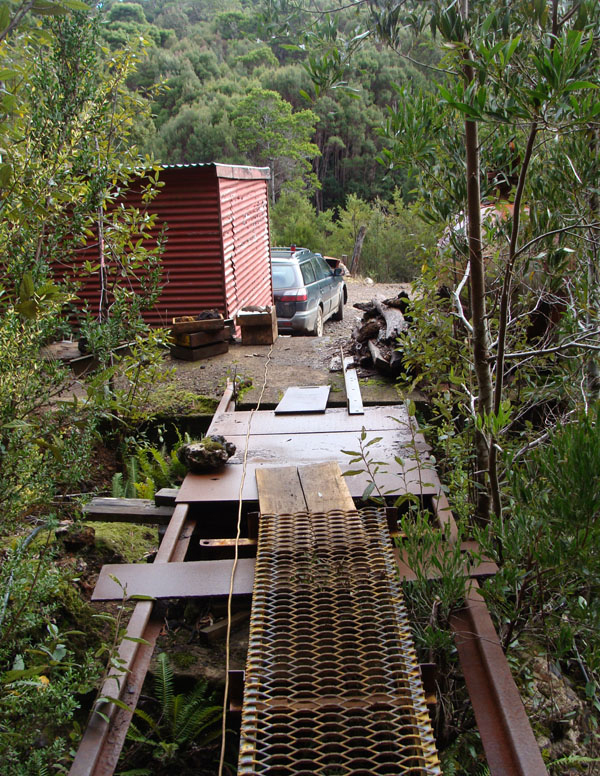 For more than 30 years (beginning around 1970), the Adelaide Mine was owned by Frank Mihajlowits. 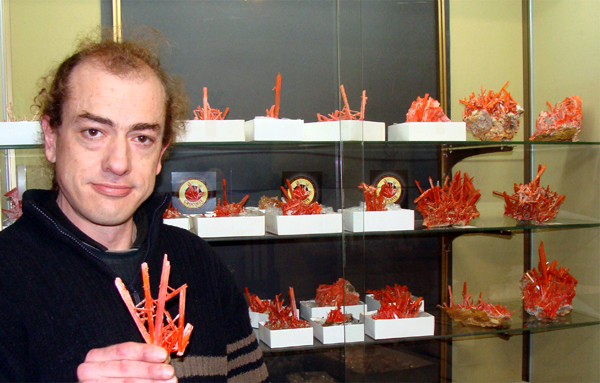 His dedicated collecting brought the world some of the very best crocoite specimens. In July 2004, The Adelaide Mining Company Pty. 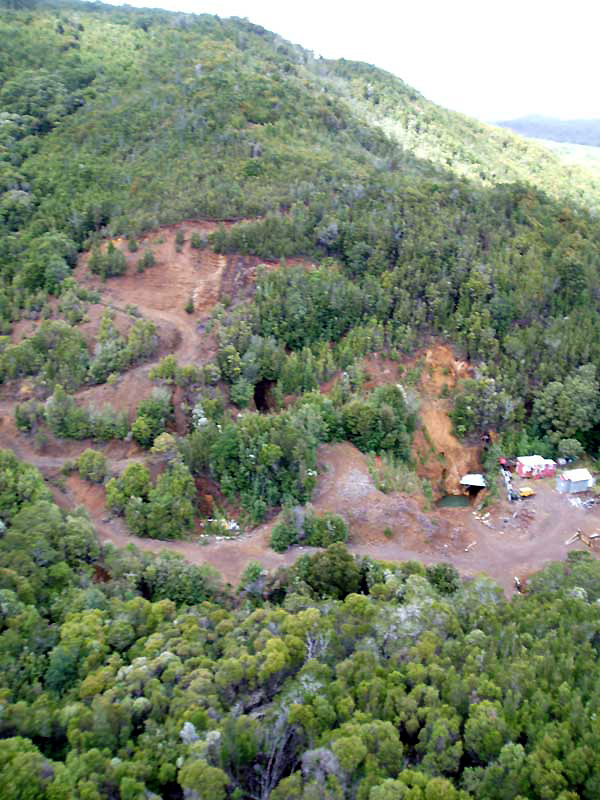 Ltd. (TAMC) purchased the Adelaide Mine lease and a new specimen mining program commenced. 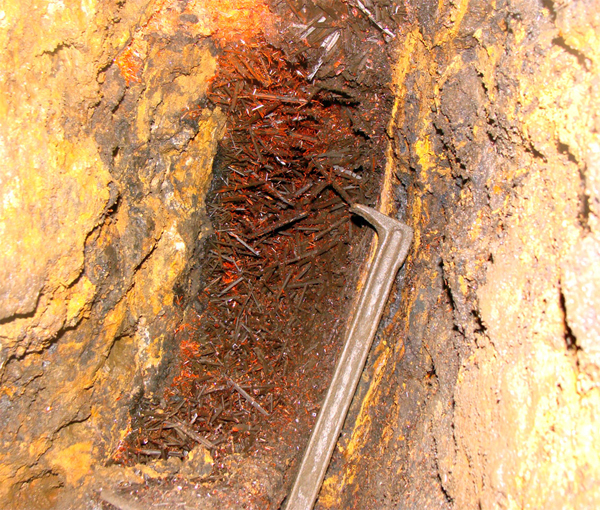 The exploration in the mine is relatively small with only a few miners. TAMC has a rule that at least two people have to be present on the mine lease whenever there is any underground work being done. TAMC started working in 2004 and found their first good pocket (Premiere) in July 2006. Since then they have found one very small pocket (Kurt’s) late in 2009 and there has been nothing else. The majority of mining until now has been hard work with no great return. 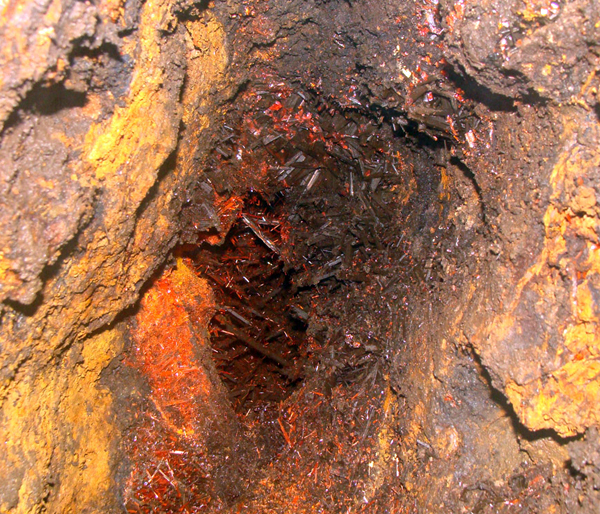 The first of the famous crocoite pockets was found at the Adelaide mine in the early 1970`s and was followed by the much larger pocket in the early 1990`s. There were no accurate records kept on the size of the 1970’s pocket but several verbal accounts detail it as being a pipe which travelled upwards for several metres in length. It has been reported that only around 20% of this pocket was actually recovered intact and the rest was destroyed in the process of extraction. It is unknown exactly how many specimens this pocket produced but it would probably be in the hundreds rather than the thousands. Of those produced only a very small percentage where in the upper echelon of mineral specimens. The 1990`s pocket was the biggest by far at up to 1 metre wide, 14 metre long and 10 metres deep. This pocket produced thousands of good specimens over the roughly 10 years it took to mine. Although there was many more specimens recovered from this pocket it still only yielded a very small percentage which were in the top league. The new pocket, that turned out to be a very good one was named „2010 Pocket”. It was about 2 metres long by 1 metre high and up to 45 centimetres wide. The pocket took a bit over two months to extract, working roughly four days every second week. 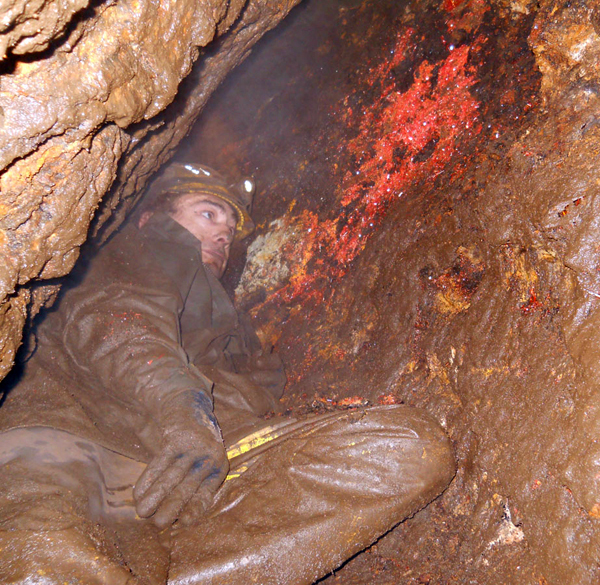 The mining is very hard, dirty work, and after four days a break to recover is necessary. The crystals growing off the footwall of the pocket mainly formed in radiating sprays and were better supported, so more of the crystals stayed in place. The crystals which had grown off the hanging wall had their weight working against them so more of them seem to have fallen, leaving mainly smaller crystals and only those bigger crystals which had grown in more gravity friendly positions. 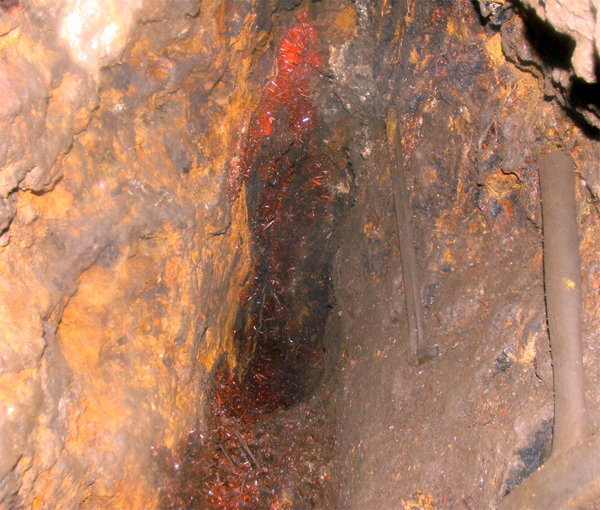 At the bottom of pocket were found piles containing large numbers of loose crystals and detritus. 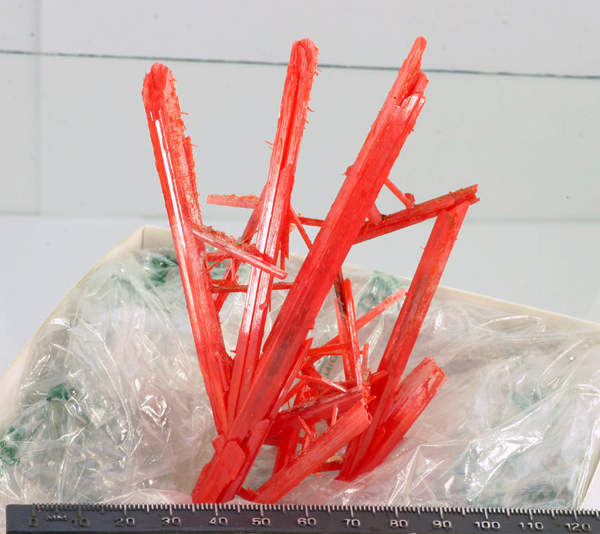 It seems likely that while the first generation crocoite crystals were growing bigger and heavier, the matrix to which they were attached got softer and weaker until some of them could no longer be supported and they fell to the bottom of the pocket. 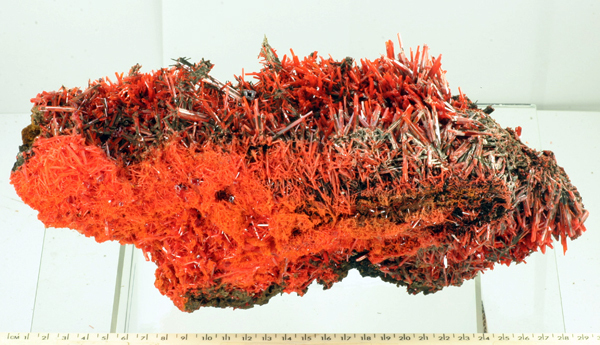 At some point the large crocoite crystals have been coated by ferro-manganese oxides. The coating, even though it at first may seem to spoil the aesthetics of specimens, stopped the crystals from spanning the whole space and becoming a solid seam instead of remaining an open pocket. Over time more detritus dropped down and this accumulated mostly onto the higher sides of the footwall`s radiating clusters. 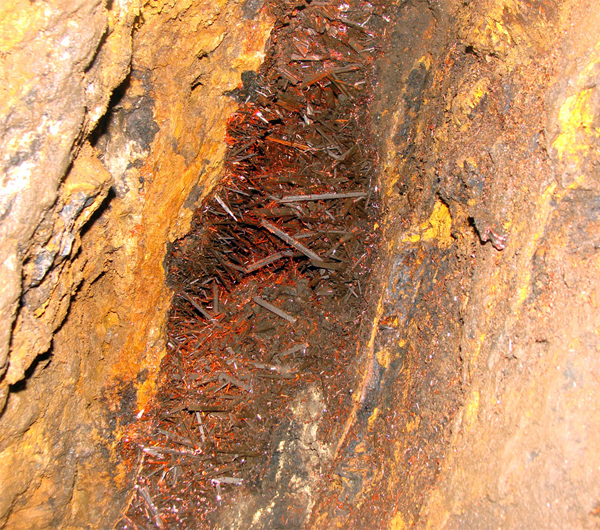 A thin coating of dundasite and gibbsite was then deposited, mainly over just the exposed upside faces of the crocoite crystals. 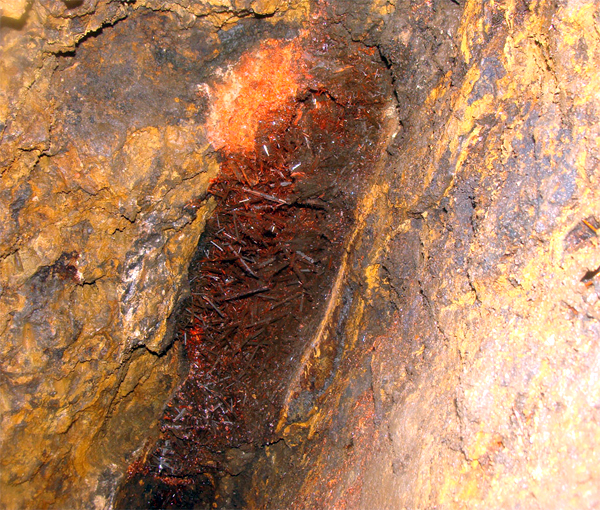 After that, additional ferro-manganese oxides appears to have been added. 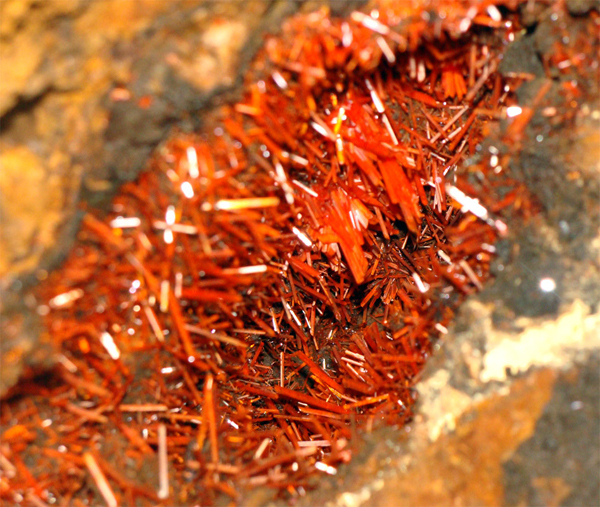 The final stage was the growth of another generation of crocoite crystals, being the small bright red crystals coated over the top. 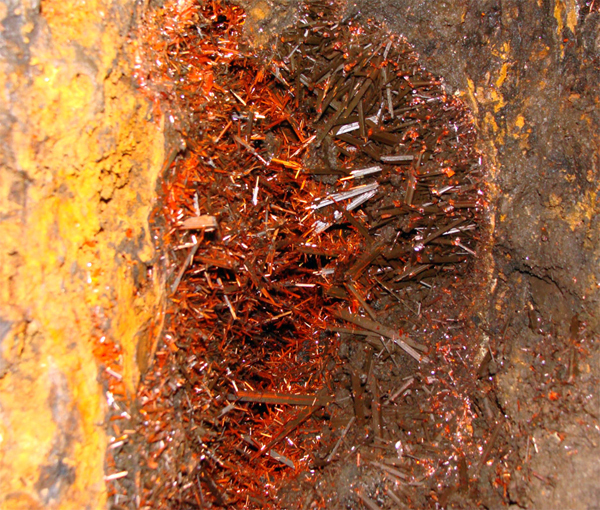 When this last growth of crocoite occurred it also had the affect of rehealing many of the broken ends on the fallen crystals and their stumps by creating multiple small terminations on their large ends. You can see the generational layering quite clearly in the images below. 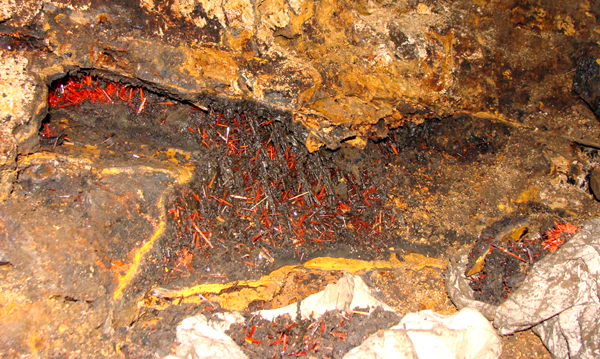 There was around 350 specimens of collector grade or better recovered from the 2010 Pocket, not including the many loose single crystals found in the detritus at the bottom of the pocket. These specimens range from thumbnail to very large cabinet in size. 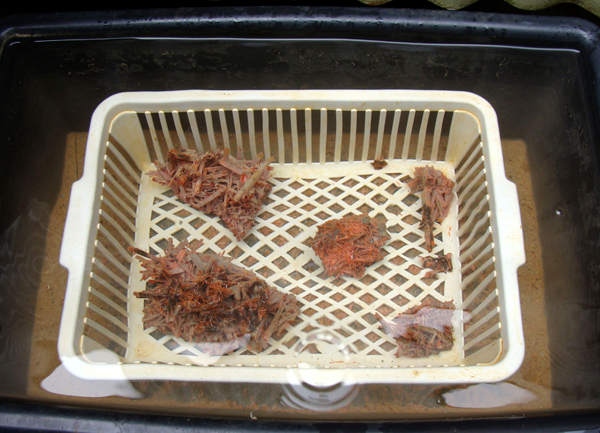 The colour of the crocoite from the 2010 pocket varied a lot between the specimens and covers the spectrum from intensely bright orange through to a very deep red. The largest crystals from the 2010 pocket are up to 14 cm in length, probably some of the longest known that are not contacted terminated or broken. 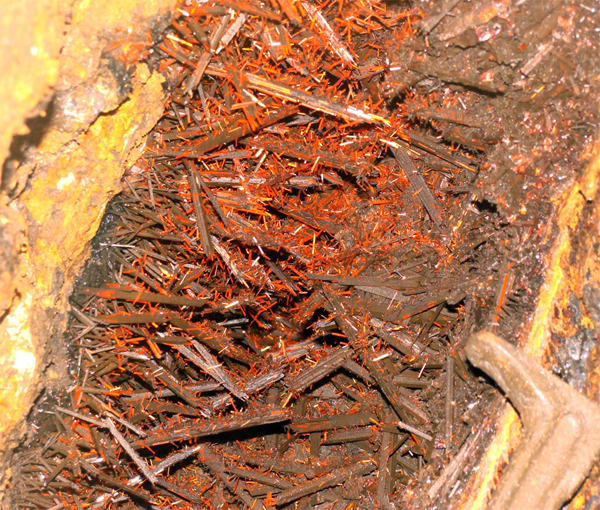 A large percentage of the specimens come out with a dull black coating over the larger crocoite crystals. 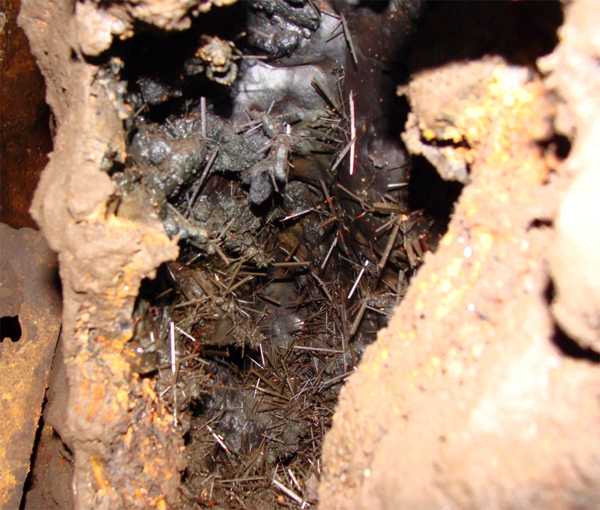 These are bathed in several different chemicals to remove the ferro manganese oxides and dundasite coatings from them. This process reveals the bright colour and shiny lustre which was hidden underneath. The 2010 Pocket was roughly similar in size to the 1970`s pocket and thus not the largest, but some of the specimens from the latest find rival those two earlier finds in terms of their significance. Most probably, the large crystal size and brightness of colour of the 2010 material has only ever been matched by a very small portion of the 1970’s find. The more typical and well known material from the 1970’s find is the radiating sprays of gemmy red, sharply terminated crystals however it seems that there was also a small amount of material recovered back then which was very similar to the new 2010 Pocket specimens. This type of 1970’s specimen were apparently very few in number and hence seldom seen or even heard of. It seems that 2010 pocket is one of the best ever discovered in the mine. Looking to the cyclical 20-years between finds we will probably have to wait till 2030`s to see another great find! Let us just hope this is not the case and that more great material is found a lot sooner ! 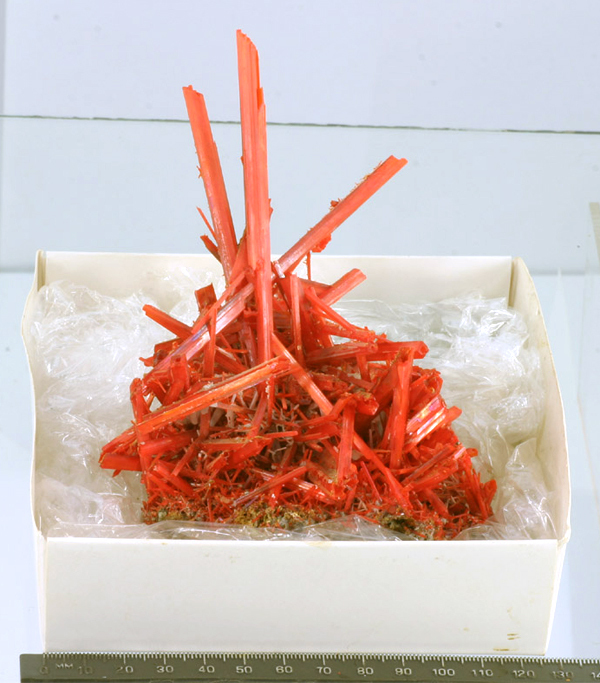 See New Crocoite specimens in our store. 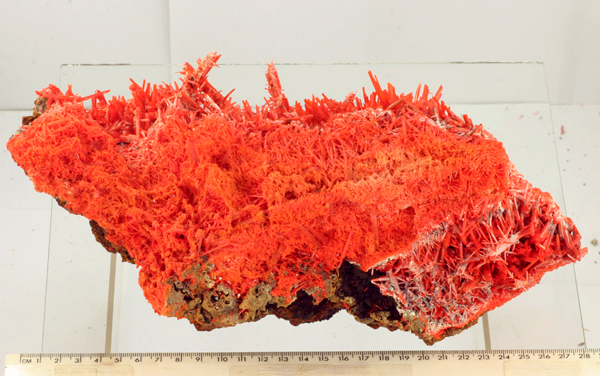 See New Crocoite specimens on our ebay. Aerial view of the Adelaide mine (late 1990`s). Photo R. Reid. Workings and vicinity of the mine. Photo A. Wright. 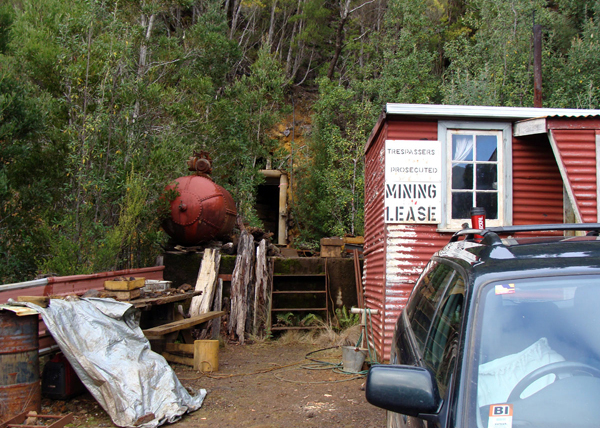 Adelaide mine buildings. Photo A. Wright. Mine buildings and the adit (in the center). Photo A. Wright. Mine adit. Photo A. Wright. 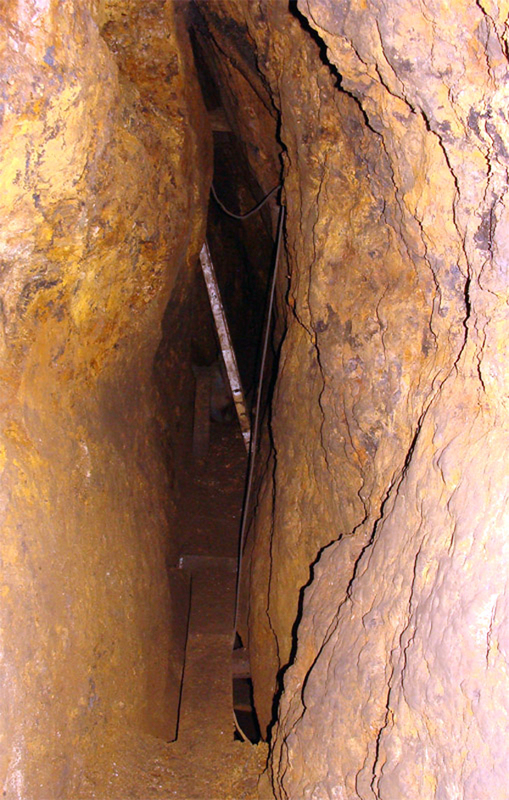 View from the mine entrance. Photo A. Wright. 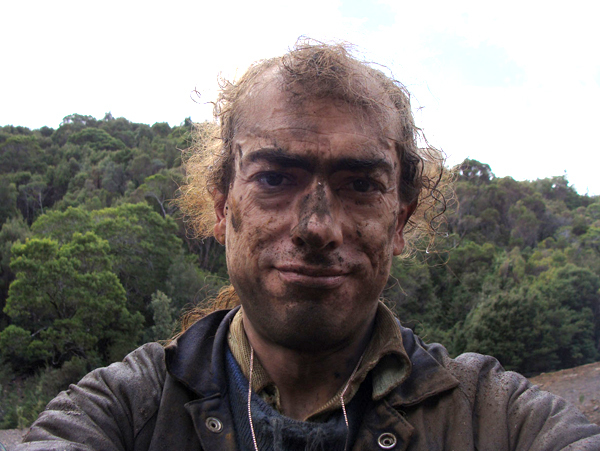 Adam Wright - co-author of this article and one of the mine owners, after the work in the mine. Photo A. Wright. 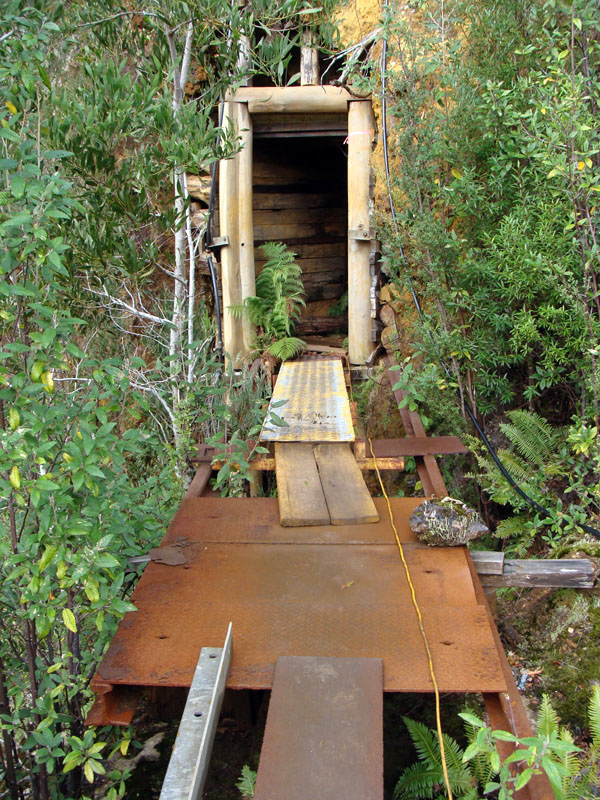 Plan of workings in the Adelaide mine; most important pockets from last 20 years are marked. One of mine tunnels. Photo A. Wright. Adam collecting specimens in the area of 2010 Pocket. Photo A. Wright. Zone were 2010 Pocket was found. Photo A. Wright. One of small pockets found just before the 2010 Pocket. Photo A. Wright. Another footwall pocket found before the discovery of 2010 Pocket. Photo A. Wright. 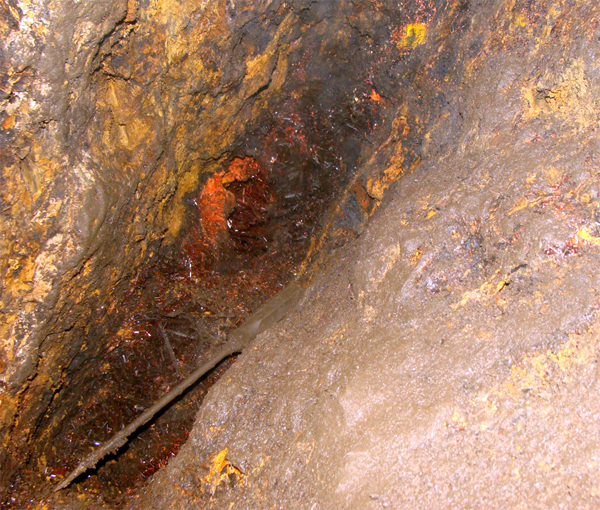 The next pictures show how 2010 Pocket was opened and changed in the time of excavation. This picture is a beggining of the pocket. Photo A. Wright. Closeup of the first opening of the 2010 Pocket. Photo A. Wright. Pocket already more open. Photo A. Wright. Closeup of picture above. Photo A. Wright. 2010 Pocket. Photo A. Wright. A slightly more open space in the 2010 Pocket. Photo A. Wright. Close up of the more open space. Photo A. Wright. 2010 Pocket ig going to be finished. Photo A. Wright. Another closeup. Photo A. Wright. 2010 Pocket is almost gone. Photo A. Wright. 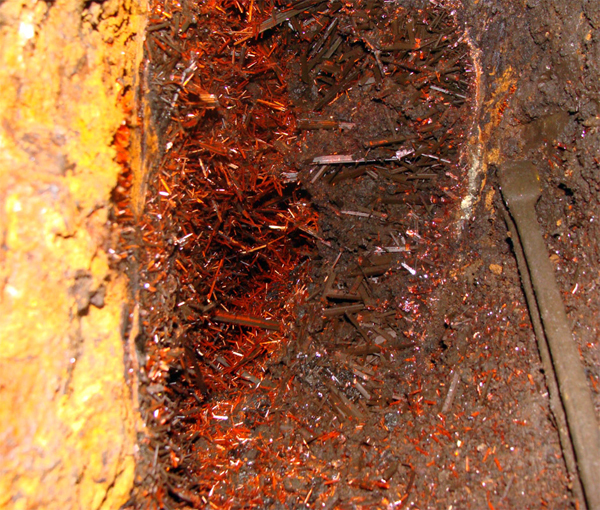 Last openings in the zone with very clean second generation crocoite crystals. Photo A. Wright. Last openings in the pocket. Photo A. Wright. Cleaning specimens from 2010 Pocket. Photo A. Wright. 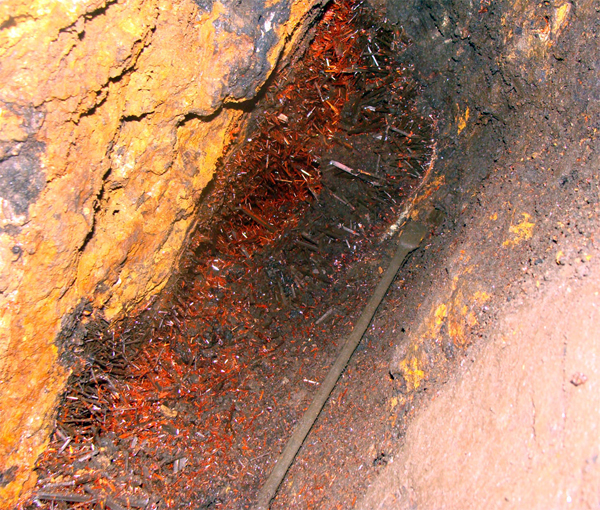 One of the first specimens mined from 2010 pocket, before cleaning; size 29 cm, the longest crystals up to 5 cm. 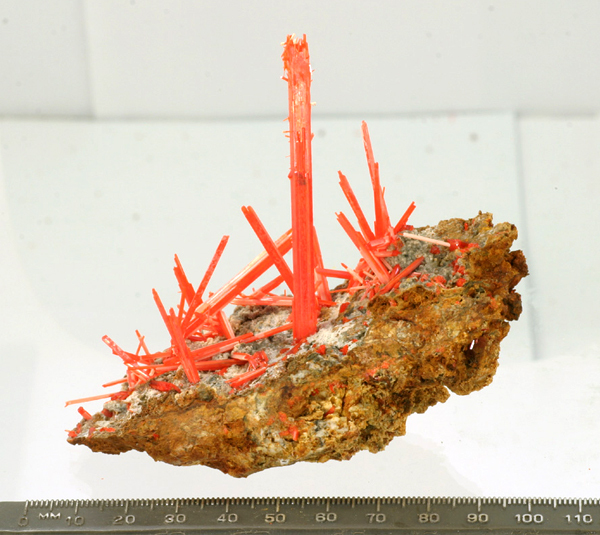 Same specimen after cleaning; size 29 cm, the longest crystals up to 5 cm. Photo A. Wright. One of the best collected specimens before cleaning; size 9.5cm, the longest crystal is 13.5cm. Photo A. Wright. The same specimen after cleaning; size 9.5cm, the longest crystal is 13.5cm. Photo A. Wright. Another great specimen from the pocket. Photo A. Wright. One of the best specimens from 2010 Pocket; size 16,5 cm, the longest crystals up to 10 cm. Photo A. Wright. Another view of the same specimen; size 16,5 cm, the longest crystals up to 10 cm. Photo A. Wright. 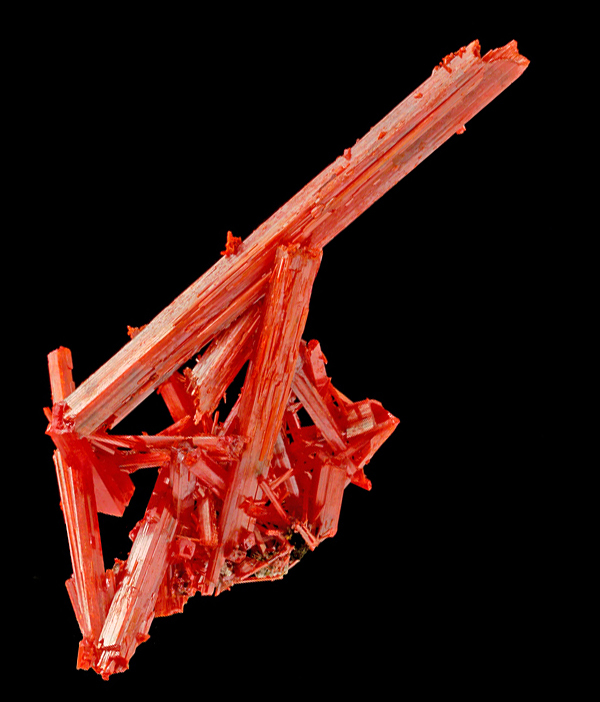 Another view of the same specimen; t133 16,5 cm, the longest crystals up to 10 cm. Photo A. Wright. Another view of the same specimen. Photo A. Wright. Another good quality specimen; size 9,3 cm, the biggest crystal 7,5 cm. Spirifer collection. Photo G. Bijak. One more top specimen; size 10 cm, the longest crystal 9,5 cm. Photo A. Wright. Adam with some of best specimens from the find. Photo E. Aheimer. This is a new feature, you can add comments on our web page! 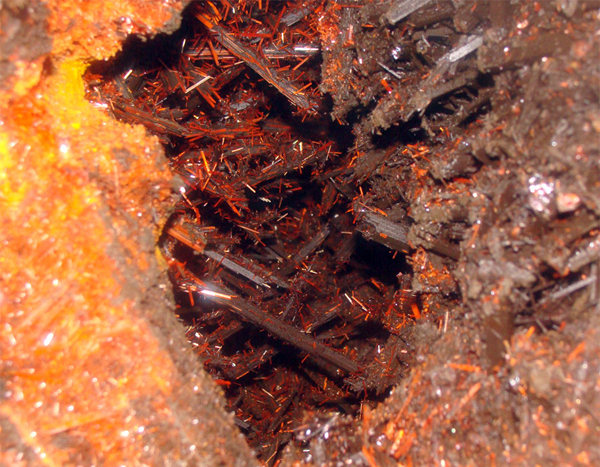 These pictures satisfy some of my curiosity about how crystals look in situ. Thanks so much! Recent technology (cameras in mobiles, small compacts) help very much in making documentation of new finds. It is a great article and pictures are excellent, but what do the use to clean the crystals? Ultrasonic bath with some kind of solvent? NB. Of course I had to buy a piece.